The ARTS™ application is designed to aggregate equipment information from multiple data repositories. The implementation and subsequent maintenance of these systems are typically performed at different times, by different personnel (possibly organized within different refinery or corporate divisions), and with different methodologies – resulting in disparate information across the facility. 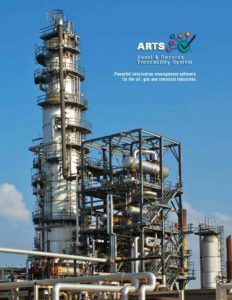 ARTS™ sets a whole new standard for long term data reconciliation and management for petroleum refineries and chemical plants. ARTS™ combines data into a single user interface that is available to all personnel and identifies discrepancies, verifies data from the right records, facilitates data correction, and monitors future changes. ARTS™ has been recognized as a PSM program strength during Process Safety compliance audits. The implementation, methodology and maintenance of multiple databases are typically performed by different personnel. Much of this data is compiled independently of each effort without recognizing all systems accessing it. This results in conflicting information across the facility. The ARTS™ application allows the facility to identify these discrepancies and deficiencies and correct them. The ARTS™ system combines data into one user interface for quick review and evaluation. ARTS™ is able to handle any engineering data or documents stored for any equipment type. In addition, ARTS™ significantly reduces resource requirements for implementing, maintaining, and publishing Process Safety Information. ARTS™ has been recognized as a PSM program strength during Process Safety compliance audits. ARTS™ allows information from engineering applications to be made available to individuals or groups without licensing restrictions. The ARTS™ web-based interface also eliminates the need for training on individual engineering applications. A unique feature of ARTS™ is the ability to compare, and then verify, information by linking documents to ARTS™ data records via an Annotation feature, which then allows for “traceability” and verification of the correct data associated with the engineering document(s). Your facility can be confident that discrepancies identified in ARTS™ are measured against validated and reliably accurate information. The ARTS™ program works with a limitless number of database systems and allows each user to configure their individual preferences including favorite assets, saved searches and user interface screens. Now, more than ever, with challenges facing plant performance and productivity, increasing oversight from OSHA and other regulatory agencies and the audits that accompany the oversight, it is vital that plant assets are tracked with traceably, factual, verifiable and actionable information.